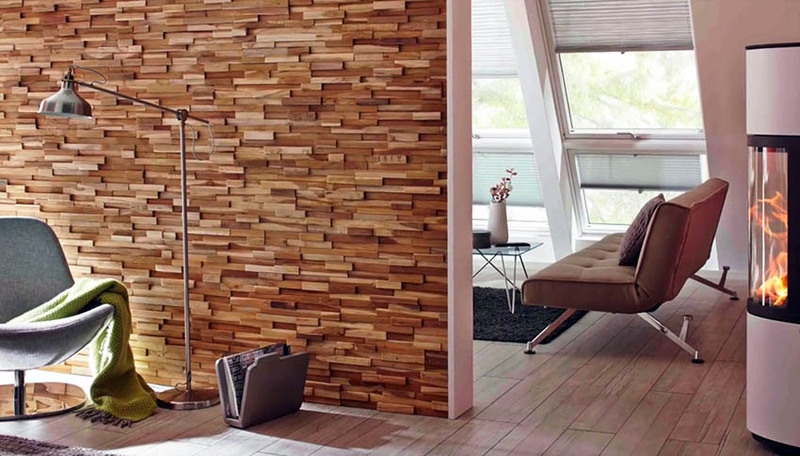 On this page we share some creative accent wall ideas for the bedroom, living room and dining room. Accent walls, you either love them or hate them. Until now, that is. With a few tips from the pros, you can start seeing accent walls as a positive asset rather than a holdover from the 90’s. 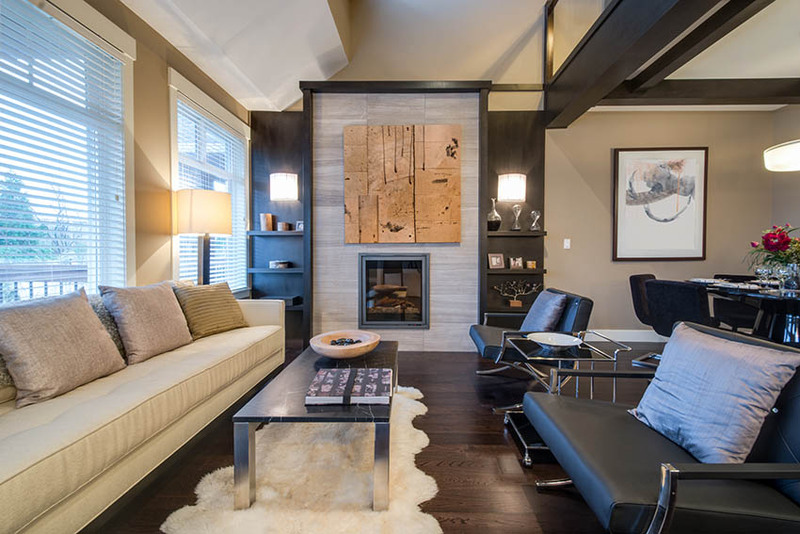 Homes just beg for accent walls, they create a focal point, add a bit of drama, and provide a way to give coziness and separation to an open plan that is a little too open. If you have built-in shelving or a wall niche along one wall, you already have an accent wall! Make it really stand out by painting or wallpapering the inside of the shelving. Be selective when deciding what to put on the shelves, these aren’t utility shelving, so display things that are beautiful and special. Vary the contents on each shelf, you can even hang small photos on the back wall of the shelving for a unique, sophisticated look. If you don’t have built-in shelving but like the idea of having an accent wall that looks like built-in shelving, create it with inexpensive floor-to-ceiling bookshelves and crown molding. Stock these shelves wall to wall with books, allowing the color of the spines to provide the extra pop of color in the room. Or, if you are really ambitious, you can make covers for your books, novels in pale blue, non-fiction in creamy almond, thrillers in bold red. Group the books together for on-trend color blocking that can easily be changed when you grow tired of it. Visit our page on accent wall colors for more ways to get the exact style you want. 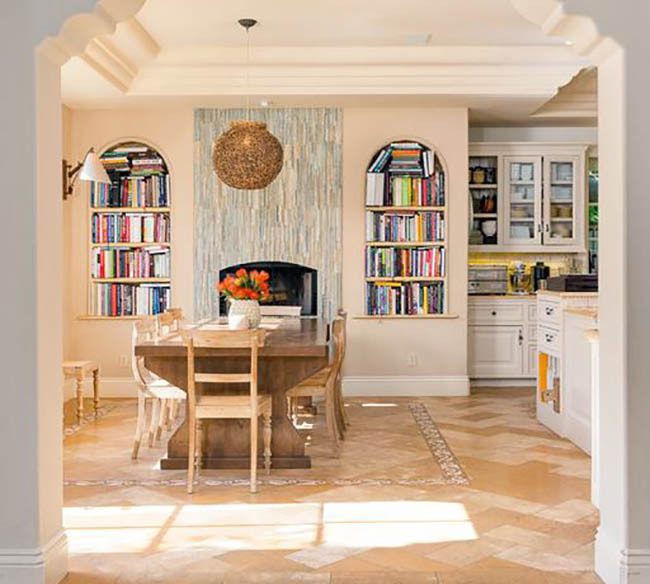 This traditional dining room with open design layout to the kitchen adds a little pizazz by including colorful cookbooks in its two arched built-in bookshelves. 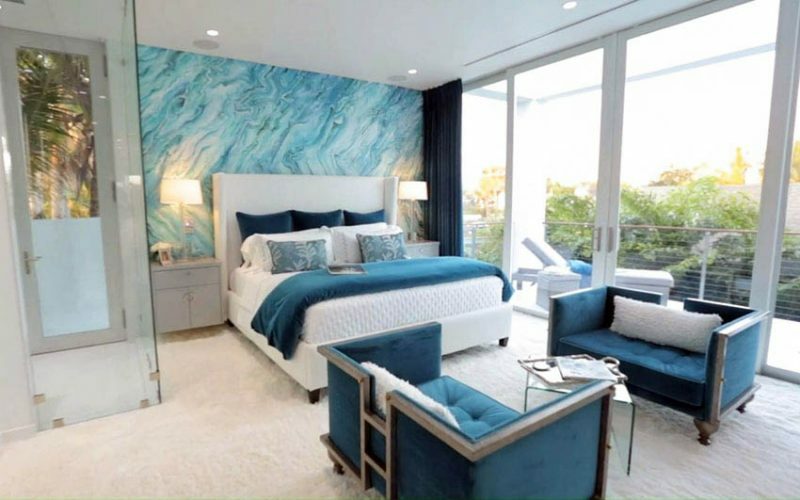 If you are going for serious drama and sophistication in your bedroom, an accent wall is the thing you need. 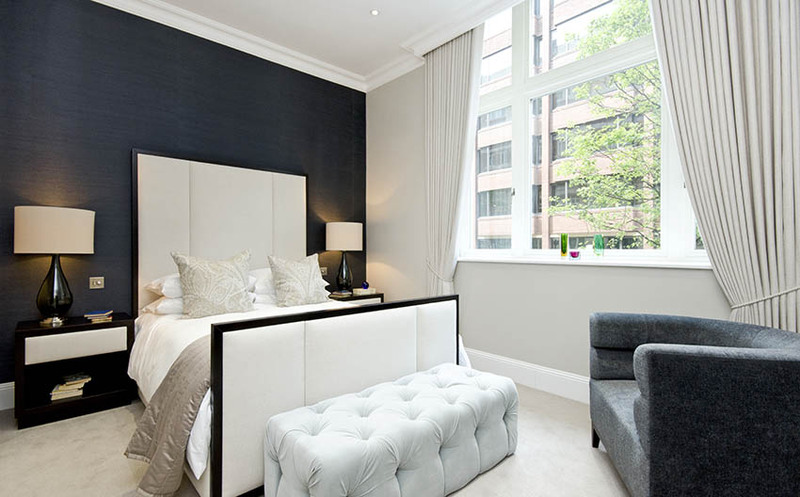 A bed with a low-headboard backed by a leather or fabric-upholstered wall creates a stunning backdrop. Hang long mirrors over your bedside table and to make them sparkle, add glass pendants hanging from the ceiling above each table. Keep the color scheme monochromatic, a pearly grey paint with a slightly darker shade of grey for the upholstery fabric. Carry the pearly grey paint throughout all of the walls in the room for continuity. 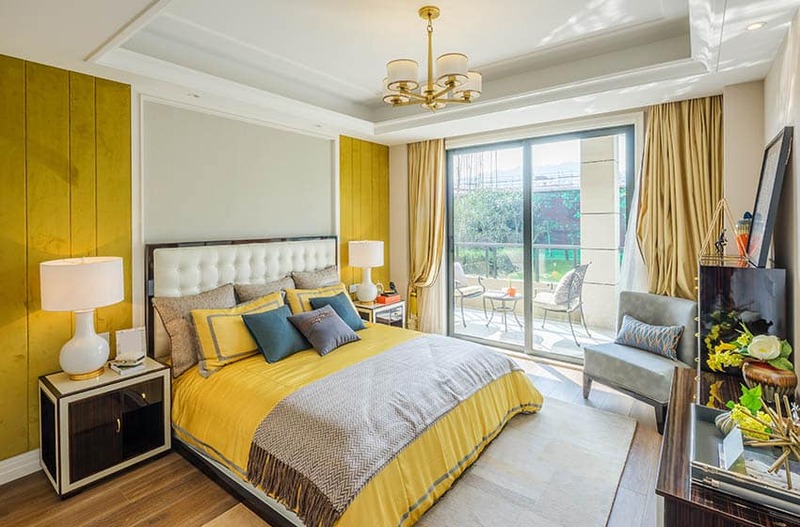 If you have a large room, the width of the upholstered wall should span the bed plus the bedside tables. If your room is smaller, the upholstered wall can take up the entire wall that your bed is against. In a house with an open plan that has a great room serving as dining and living rooms, an accent wall can help better define a space. 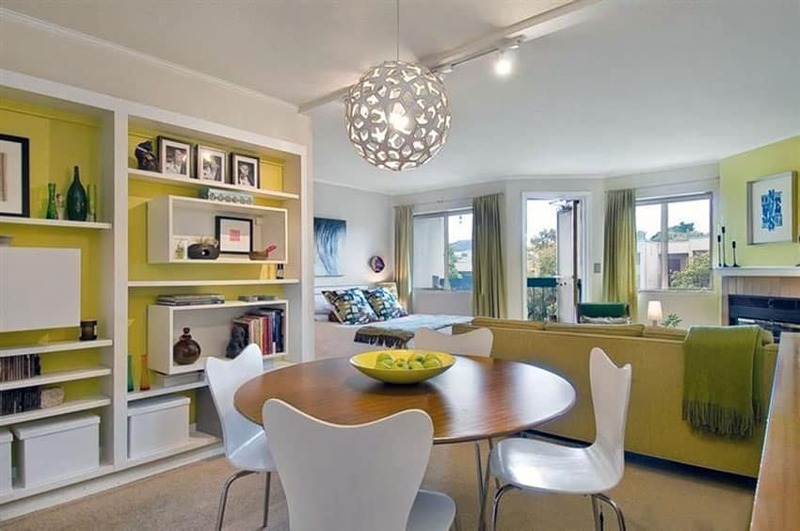 In a living/ dining room, treat the rear wall of the dining area as the accent wall. 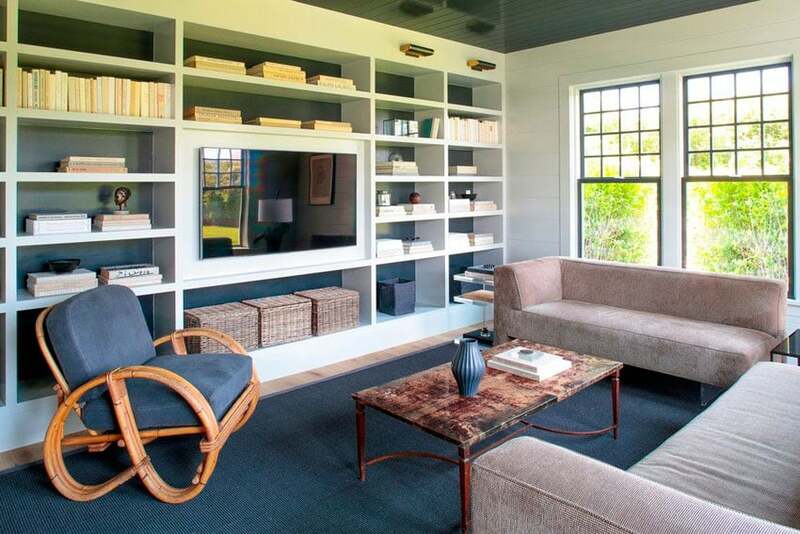 You can paint this wall a contrasting color, of course, but why stop there? 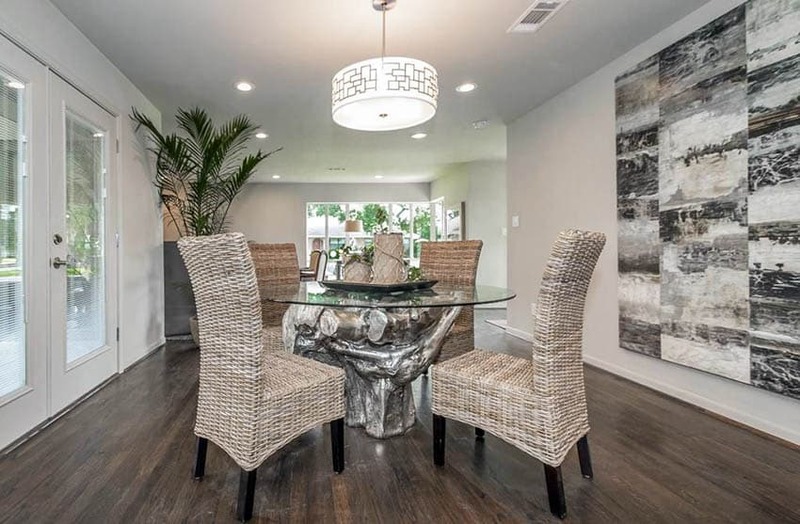 Dining rooms are often social spaces that are used for much more than dining. Think about game nights with friends, setting up the table as a buffet for football parties, or just a place for tea and a chat with a friend. You have an opportunity to create something really special. If you are into maps, get a custom map made that is the size of the wall. Perhaps that is too much drama or cost, having an oversized map custom-framed and hung on the wall has just as much visual impact. Choose a subtle color from the map to paint the wall behind the map. A favorite photograph or series of photographs would also work well here. This dining room showcases a variety of nature and landscape photography in frames set on wood shelving. Speaking of game nights, a chalkboard wall is perfect for word games and drawing games. It is also perfect for artists, young and old. A bedroom, kitchen, or living room wall that doesn’t have much going on is a great candidate for chalkboard paint. You can jot down schedules, menus, your kids can draw on the walls without damaging them, and they are easy to decorate for the changing seasons and holidays. And liquid chalk markers are affordable and come in every color, so you never have to worry about chalk dust making a mess. For a more polished look, you can make frames from simple molding and frame out spaces for your kids to draw so that things aren’t just randomly placed on the wall. This accent wall treatment also works great in a hallway, and no one ever expects a hallway to have a special wall! If you choose to do an accent wall with wallpaper, you may want to consider not leaving the rest of the walls white unless the background of the wallpaper is white. Doing so may leave your room looking half-finished. Instead, paint the rest of the walls the background color of the wallpaper. A little bit of imagination and thinking outside the (paint) box is all it takes to create a beautiful accent wall! 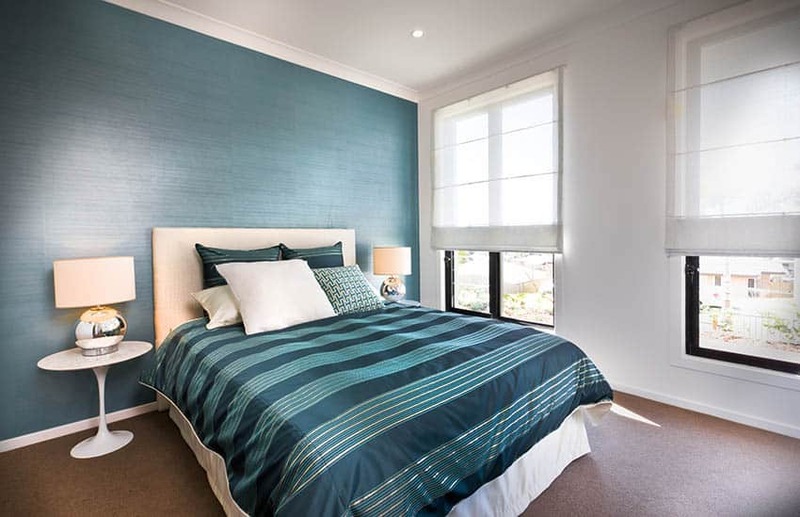 An accent wall in the bedroom is a creative way to add your sense of personal style to your room’s design. 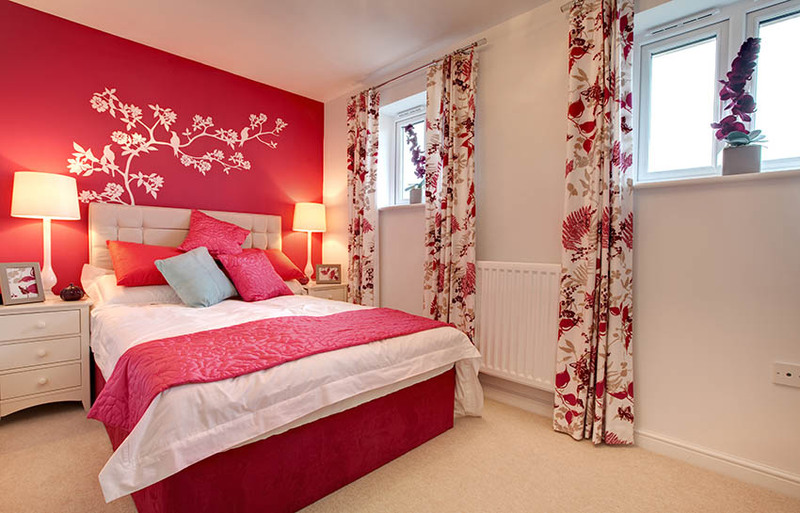 Typically, an accent wall in the bedroom is painted or wallpapered in a different paint color. 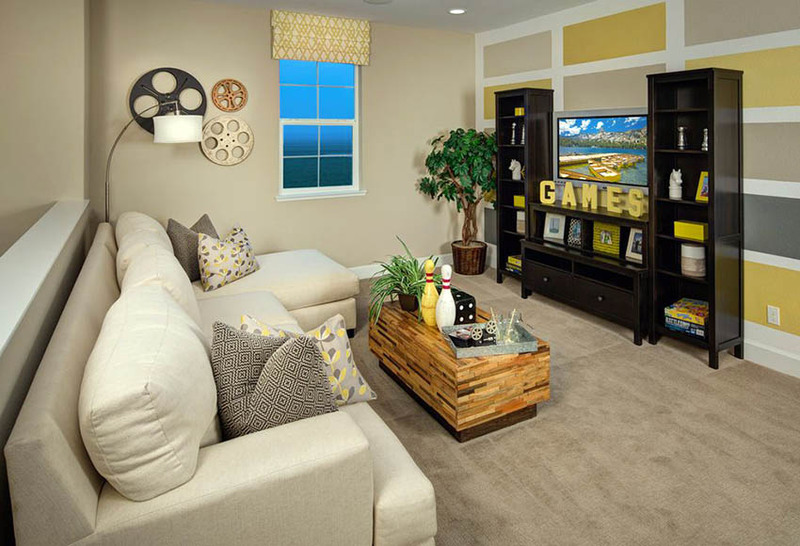 This can have an effect of making the room look larger, and add some creativity to the space. This teens bedroom offers a grey accent wall behind the bed contrasting against a white backdrop. This amazing kids Minecraft themed bedroom design features an accent wall complete with dirt blocks from the popular game. Clouds painted on the ceiling help to enhance the overall ambiance and promote the feeling of being in the game. Plenty of Minecraft related decor helps to set the mood and create a fun filled theme. Wood accent walls are a popular choice for the home and are currently popular and sought after as a way to create character in a room design. 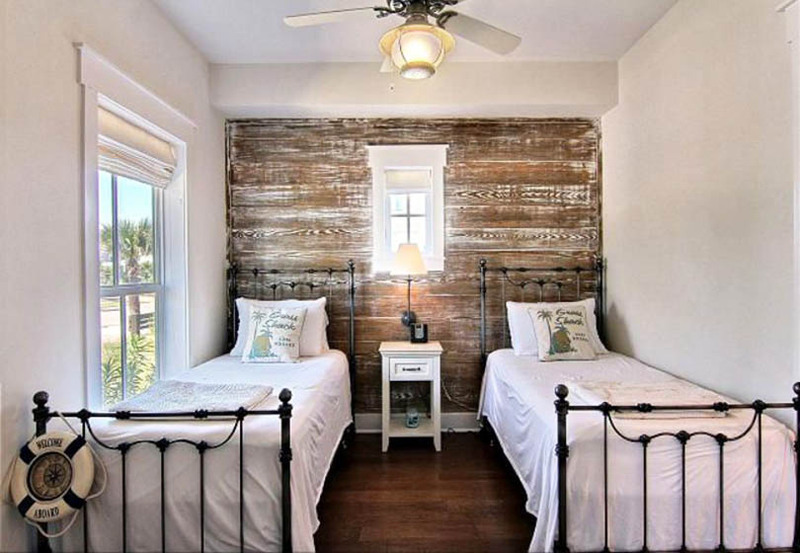 This distressed wood plank accent wall behind the beds gives a rustic, yet stylish look. A wall stencil can be a great way to enhance a kids bedroom. Not only does this room look great with the dark pink accent wall, the decor, bedding and curtains tie the colors together to create a cohesive design. This bedroom features a dark green wallpaper behind the bed. Since the color green often evokes feelings of being in nature and at peace it makes for a great color for a relaxing bedroom retreat. Something as simple as hanging lights on the wall above your bed can be an interesting way to create drama and visual appeal. 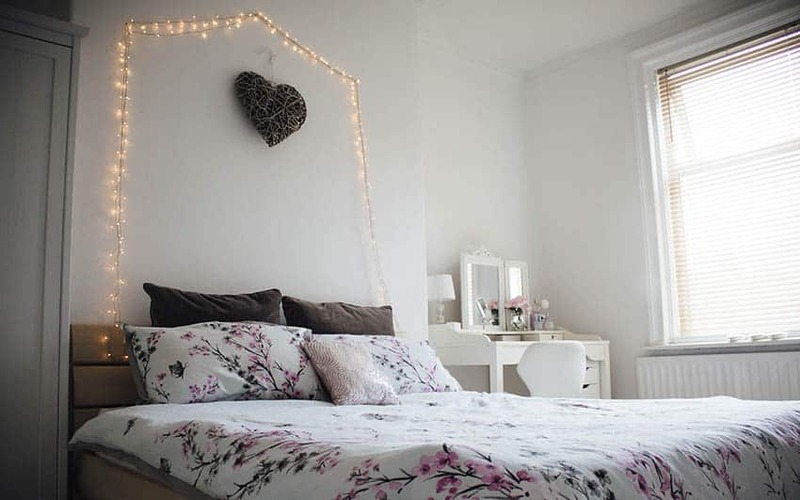 Hanging bedroom lights can create a romantic ambiance and help set the mood. The light gray of this bedroom accent wall compliments the dark yellow wood paneling on the walls as well as coordinates with the gray arm chair and throw blanket. 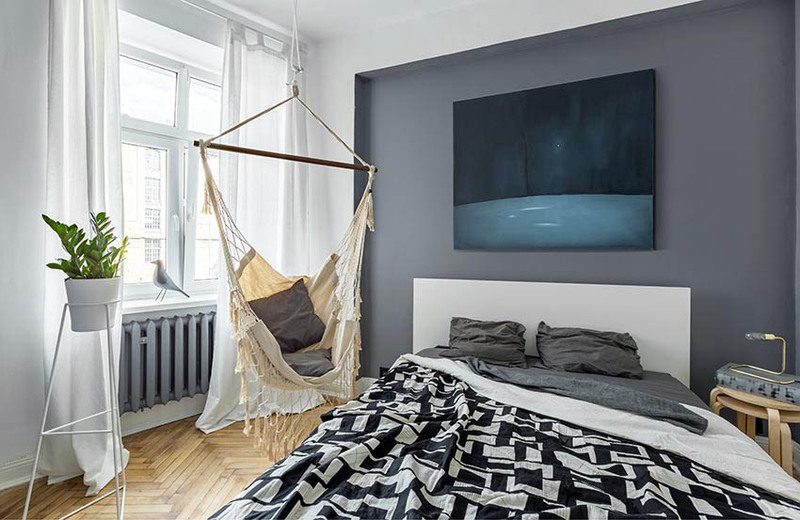 This interesting bedroom combination of black and white offers a white wall with tiny black pluses adjacent to a black painted wall. The differences in the black and white walls, furnishings and decor add a lot of contrast and patterns to the design. 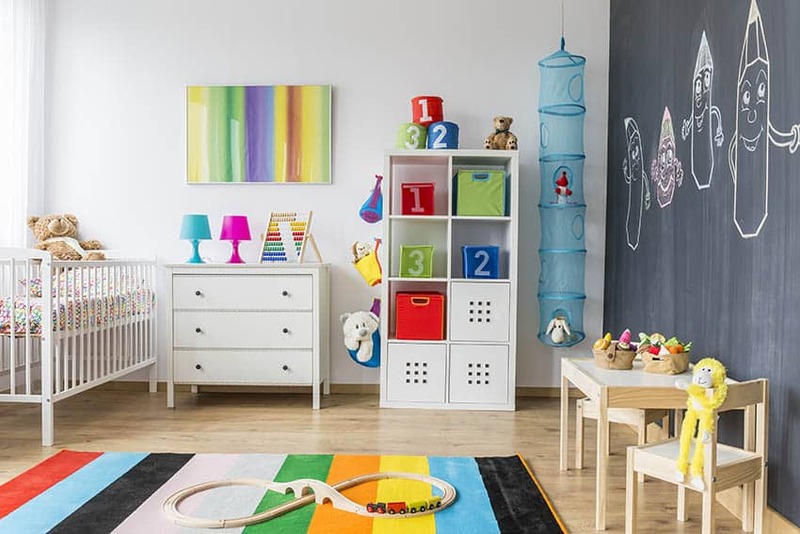 This fun kids room features a wall sized chalkboard offering plenty of opportunity for children to explore their creative sides. Colorful decor pieces help liven up the room and offset the dark wall. This glam bedroom design features a brooding black all set against a griege color wall paint. 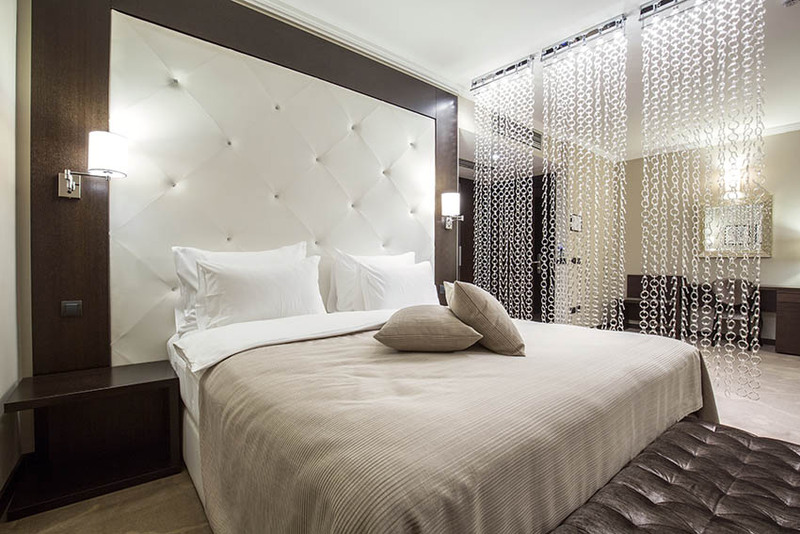 A bed with large padded headboard and tufted ottoman look stylish placed against the dark backdrop. 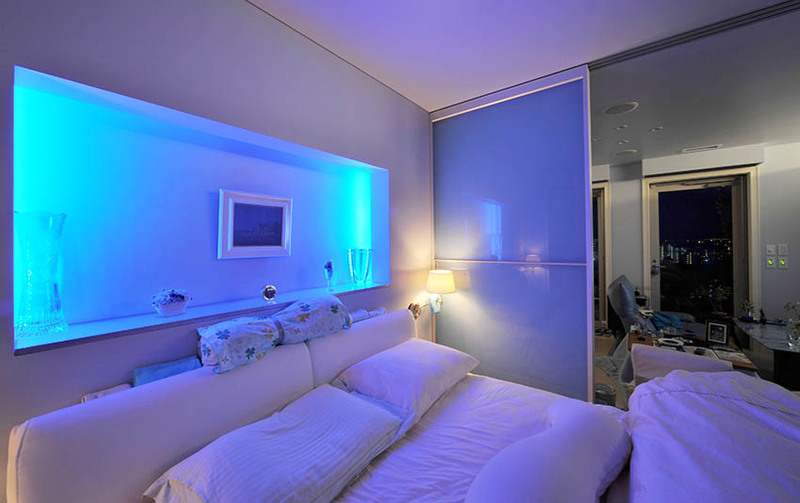 Lighting can really increase the ambiance of a bedroom and create visual interest in a space. This recessed wall alcove is equipped with neon lighting giving it a moody glow in this studio apartment. An accent wall is effective in the living room for breaking up a large space, showcase an architectural detail, add a pop of color, or promote your own personal style. This contemporary living room design benefits from the gray porcelain tile accent of the fireplace to reinforce its design style. 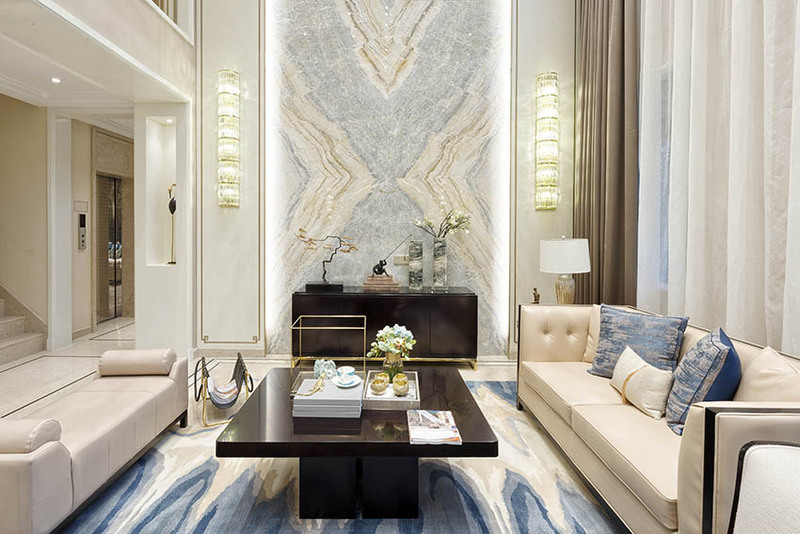 The impressive stone accent wall of this formal living room is illuminated by back-lights to add extra drama and showcase the design. These natural teak panels are crafted by Wallsupply from reclaimed wood and work well in the living room, dining room or kitchen. This contemporary living room design has a painted accent wall using two shades of gray combined with yellow and white for the borders to create an interesting backdrop. This cozy living room uses a reclaimed wood accent wall surrounding the fireplace to give a rustic design twist. Other elements in the room are kept lighter to keep the design from feeling too dark. Contrasting and coordinated colors are often used in the dining room to enhance the look. Other ideas for this space include adding a wall of family, fun & travel related photos, large wall mirror, vertical garden, vintage sign, indoor plants, wood accent wall, illuminated shelving or or even your favorite collectables. 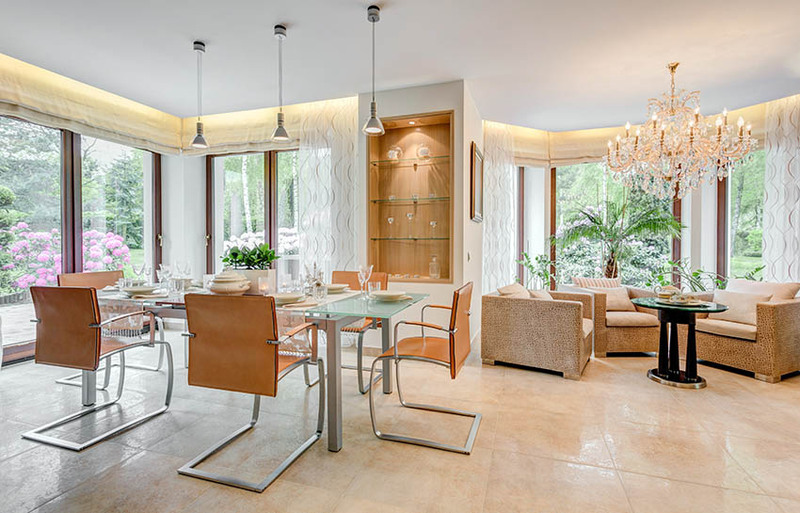 This modern dining room uses a stone accent wall to bring the eye in and create a luxurious backdrop for family and friends. 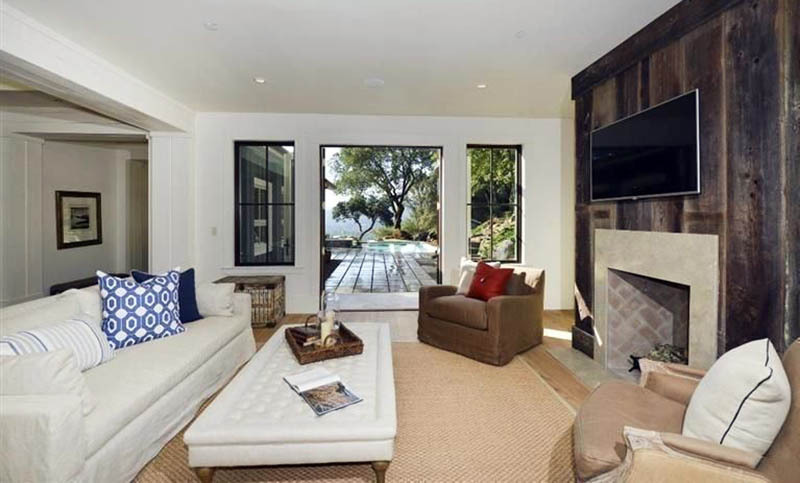 The design element is used again in the open concept living room. 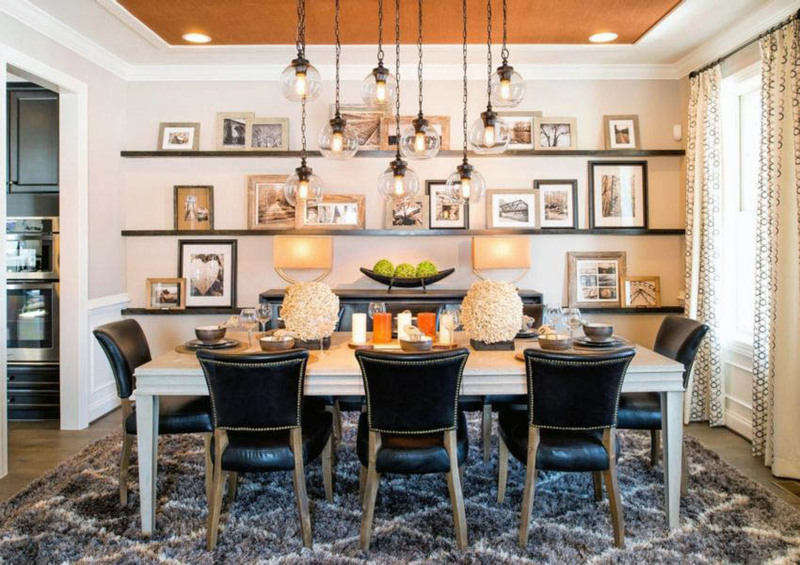 This dining room features a custom distressed wood accent wall that brings in a variety of brown shades to match the dark hardwood flooring and wood elements of the dining table. 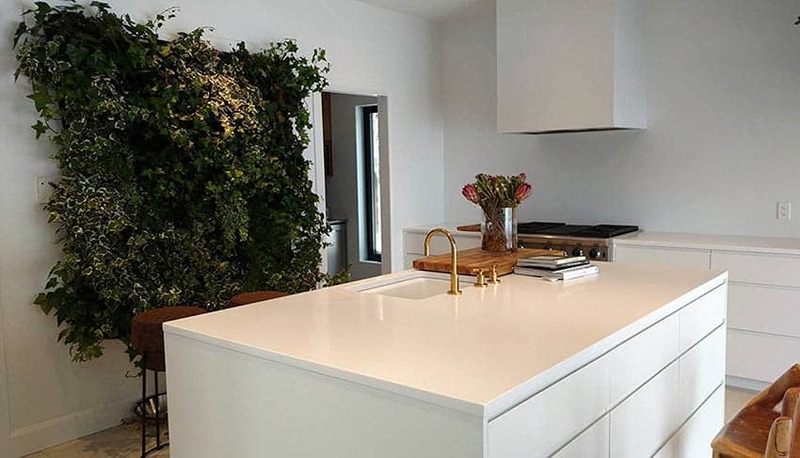 This kitchen with breakfast bar dining area shows off its large vertical garden on the opposing wall to add contrast to the all white design of the space. 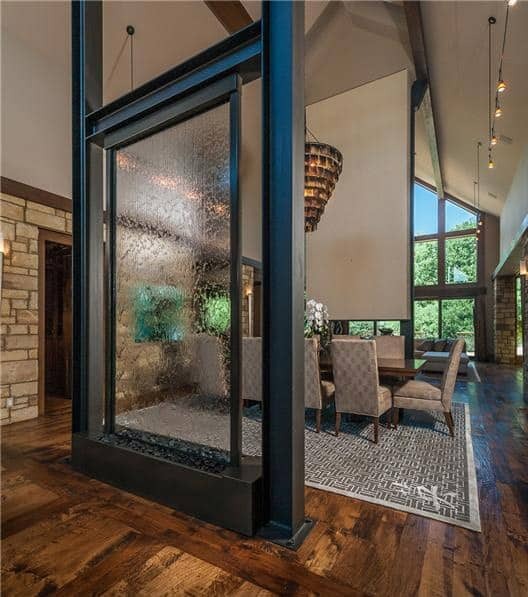 This large indoor wall fountain provides a serene ambiance and helps separate the dining room from other parts of the home. A built-in shelving unit int eh dining room can be transformed in to an accent wall by installing recessed lights to bring attention to the spot. Items stored here should be done sparingly to avoid looking cluttered.